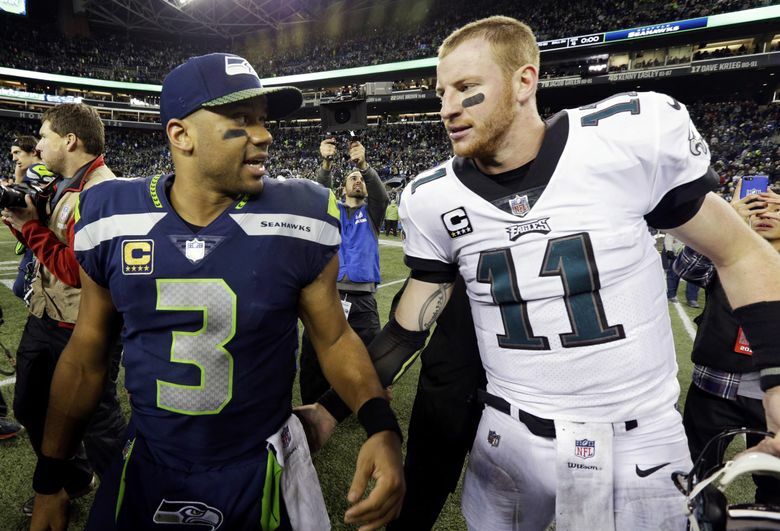 Russell Wilson and Carson Wentz traded shots in a heavy-weight battle, but it was Wilson who won the night for the Seahawks. SEATTLE — This was a playoff preview in at least one sense. By the end of the Eagles’ 24-10 loss to the Seahawks on Sunday night, all of the strengths and weaknesses and X’s and O’s and positional matchups had been rendered more or less moot. What remained were a couple of quarterbacks capable of mitigating all of the game’s other variables with their individual play. The starring role went to Russell Wilson, who spent the evening navigating CenturyLink Field as if it were his own personal playground, single-handedly offsetting the decided advantage the Eagles enjoyed in the trenches. But Carson Wentz had plenty of moments of his own, more than enough to reinforce a lesson that all of us already know: The later it gets in the season, the more a team’s fate is tied to its quarterback. In that sense, Sunday night might have featured the two NFC teams whom the rest of the playoff field should least like to face. The team that beat the Eagles is a flawed one, in a number of different aspects. The Seahawks offensive line was as bad as advertised, particularly between the tackles, where Fletcher Cox and Brandon Graham and a host of other Eagles spent the night pushing guards Luke Joeckel and Ethan Pocic around the field. Seattle’s secondary was missing a couple of Pro Bowlers in Kam Chancellor and Richard Sherman, and the absences were conspicuous at times. Yet Wilson remains a quarterback who by himself eliminates an opposing defense’s margin for error, regardless of the teammates who surround him. His biggest play came on a third-and-8 in the fourth quarter when he scrambled up the middle of the field and then, just before getting hit by Corey Graham, flipped a lateral to running back Mike Davis for a 17-yard first down. There were plenty of others, including a play late in the first quarter, when he bought enough time with his legs to allow Davis to leak out of the backfield and lose Mychal Kendricks in coverage, setting up a 23-yard catch-and-run that set the Seahawks up with a first down on the Eagles’ 38-yard-line. Wentz offered plenty of reminders of the X factors he himself brings, including a couple of huge throws on a quick 81-yard march down the field in the early minutes of the fourth quarter. The biggest of them was one of those back-breakers that Wilson has made a specialty throughout his career, Wentz weaving his way through traffic in a deteriorating pocket and keeping his eyes downfield long enough to spot Nelson Agholor getting a couple of steps ahead of his man on the back side of the play. Wentz lofted an easy pass that hit his receiver in stride and Agholor strode into the end zone for a 27-yard touchdown that cut the Eagles’ deficit to 17-10 with 12:08 remaining. In the end, Wentz made more mistakes: a bad overthrow of a wide open Nelson Agholor early in the game, a fumble through the end zone later. Along with the big things, there were plenty of little ones that went against them. There was a defensive pass interference on Ronald Darby that put the Seahawks in position to score their first touchdown late in the first quarter. A holding call on Alshon Jeffery went a long way toward taking four points off the board, coming as it did at the tail end of an 11-yard run by LeGarrette Blount that would have given the Eagles a first down near the Seahawks goal line (instead, they ended up backed up on the 14). There was a defensive holding call on Patrick Robinson on third-and-short that extended a Seahawks drive in the third quarter. In the second quarter, Lane Johnson lost his footing while pulling on a third-and-2 run. Still, this was by no means a bad loss. The Eagles might’ve been favored, and the Seahawks might’ve been a shadow of some of their better teams of recent years, but CenturyLink Field in December is not a place where wins should be expected, regardless of what the records say. The Eagles have spent most of this season showing us why they went all in on Wentz two springs ago. On Sunday, the Seahawks reminded everybody why they can’t be ruled out. Winter is coming, and it’s a season that belongs to the quarterbacks. David Murphy: on Twitter: @bydavidmurphy. David Murphy is a sports columnist for the Philadelphia Inquirer.